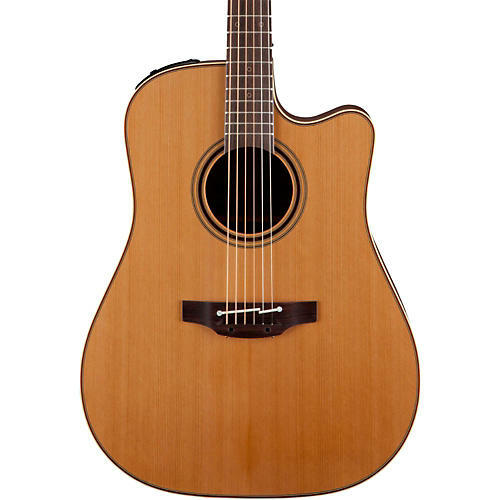 Full-size Takamine acoustic sound from a solid cedar top and enhanced electronics. Takamine‚Äôs top-line Pro Series P3DC cutaway dreadnought presents the finest in full-size Takamine acoustic sound, style and performance, with resonant tonewoods, elegant appointments and state-of-the-art electronics that deliver an exquisite acoustic experience onstage and off. The solid cedar top features hand-scalloped X bracing and ivory binding, with dark purfling and a gorgeous concentric-ring rosette with wood marquetry. An elegant Venetian cutaway offers optimum access to the upper registers. The unique Takamine split-saddle bone bridge provides faultless intonation and excellent acoustic coupling to the top. Other premium features include a solid sapele back, mahogany neck, rosewood fingerboard with wood ‚Äúdot-in-dot‚Äù inlays, gold tuners with amber buttons, natural satin finish and the highly acclaimed CT4B II preamp system with three-band EQ, volume control and built-in tuner.